I finally got around to looking at the problem tonight. The fix was very simple. My apologies for not addressing this sooner! The problem was due to the volume range on the original Exaile going from 0-1. For some reason on maemo (OS2008) the volume range is 0-10. According to the gstreamer volume control docs the range should be 0-10, so I’m not sure why the original Exaile works properly on my desktop machine. 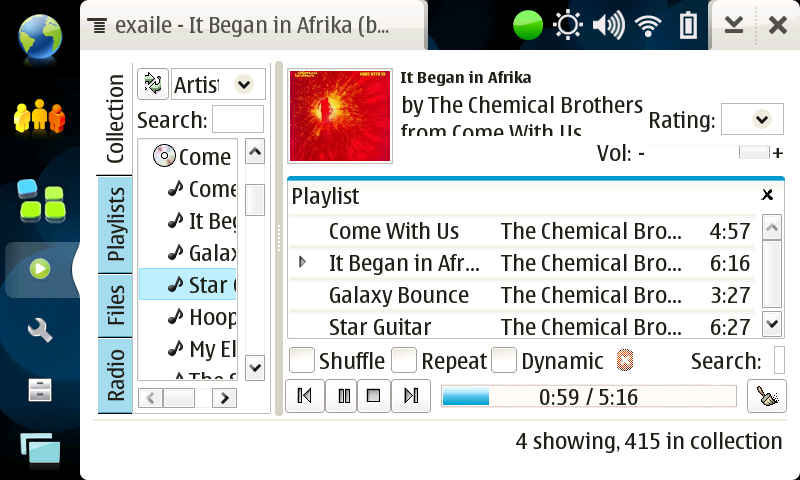 Anyway, I mainly use Kagu and Vagalume for music on my N800 these days. As a result I haven’t done anything on maemo Exaile for ages. I hope to one of these days, though. I’ve made a new release of Exaile for maemo 4.0 (i.e. OS2008, chinook). This drops a bunch of backward compatibility patches needed for OS2007, and takes advantage of some gtk 2.10 features. Also, there was a bug in the gtk shipped with OS2007 that prevented activating items in the sidebar. This has gone away, so now there are more playlist actions available. Note that the previous release won’t work on OS2008 because the id3lib gstreamer element is called id3demux in OS2008. If you are in need of a player that handles Ogg Vorbis, m4a and mp3 (among others) on OS2008 and has decent playlist management features and you are willing to put up with a slightly slow and fat app then Exaile for maemo may be for you. I’ve updated the maemo port of Exaile to version 0.2.11. There are not many visible changes, apart from alphabetic separators in the collection list. I now include the bytecode-compiled pyc files, so startup time should be reduced slightly. It still takes a bit long to start up though. I’ve been using this for about a month now and it seems to be stable enough. This will probably be the last release for OS2007. I’ll make a release for OS2008 once I have that installed and working on my N800. I’ve whipped up a webpage for the Exaile N800 port. This has the latest packages, screenshots, todo list, etc. Double-clicking the playlist items in the sidebar doesn’t work. This is due to this bug in maemo gtk. Vote for it if you want this fixed. There is plenty still to be done. I don’t have stacks of time to work on it at the moment. Send me some encouragement and I may work a bit faster. Next, I’ll probably work on making the interface a bit prettier, starting with hildon-izing the menus. I’d also like to add Replay Gain support to Exaile at some stage. And of course there are still a few bugs to iron out. There is a TODO file tucked away somewhere in the package with more details on things that need to be done. BTW, make sure you change the foreground color in the preferences for the OSD notifications. There is some problem setting the background color at the moment which results in the notifications appearing blank. I’ll fix this (at least the default setting) soon.